This post contains affiliate links. I may earn a small commission if you purchase an item I link to on this website. Your purchase helps support the maintenance of this blog and the creation of the recipes I share with you. With that in mind, I modified the recipe a bit. And it was so, so worth it! I also must admit that I bought beef already shaved at the grocery store. Its meant for steak sandwiches, but I knew I wouldn’t be able to slice it thin enough without freezing it a bit first, and frankly, I was hungry! Also on the list of things I didn’t have – I didn’t have dashi, or the supplies to make it. I’ve wanted to try it for a long time, but we have no international markets around us. Its weird, but when I go visit the parents next I’ll make sure I stop by the Japanese market there. Since I didn’t have it, I substituted beef stock. It worked just fine for me! This recipe is super, super easy! First, make rice according to the directions on your package. I make rice in a rice cooker, according to the directions my Hawaiian roommate taught me. Her method has never failed me. I’d explain, but it really needs a video, because its not traditional measuring. I recommend you slice all the veggies in advance. It will make life much easier. I use a fancy tool I bought at a local craft show that juliennes the veggies. You could easily do it by hand, but I was going for quick. I sliced the onions as thin as I could, and then sauteed them for about 5 minutes over medium heat with a little oil. Once they were starting to get a bit translucent, I added the carrots and about 1 c of stock. Then I covered it for 5 min to let them soften a bit. While the carrots were going, I mixed up the sauce ingredients. Of which there are only three. It doesn’t seem like it will have that much flavor, but it is deceiving! Its a mixture of soy sauce, mirin, and dashi, or in my case, beef stock. I just stirred it together and then left it to the side in a bowl until I needed it. Once that was done, I scooped the veggies into a bowl, and dropped in the beef. I was using a ceramic no-stick pan (which I highly recommend) and there was a little oil left from the veggies, so I didn’t need any extra. You may need to add a bit of oil to the pan. It is extremely thin beef, so it takes almost no time to cook. Once it was mostly cooked, I put the veggies back in, and then poured the sauce ingredients over it, and let it simmer for about 5 minutes to finish cooking the beef. 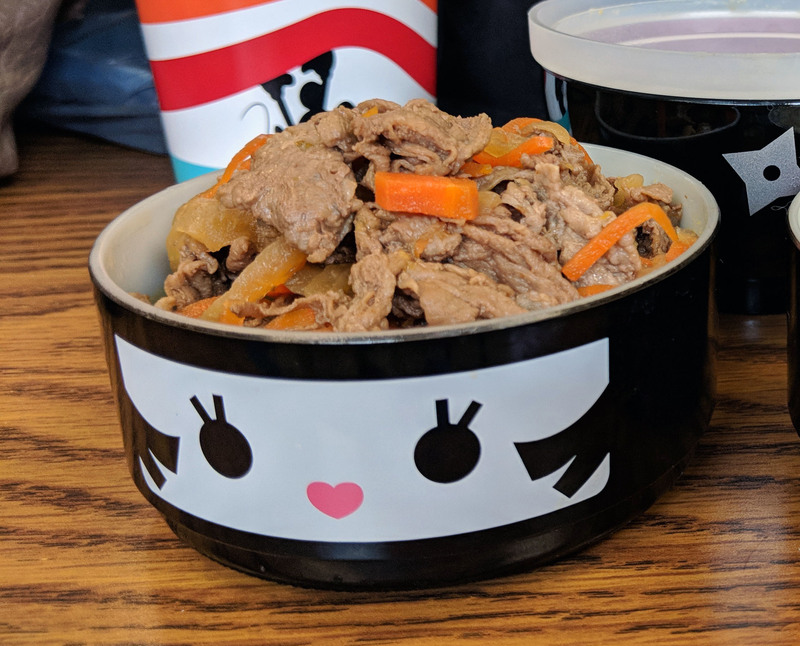 I must admit that I might have let my stomach rule when I bought the beef, so it made enough for huge dinner portions, lunches, and leftovers the next night. You could easily make this half the amounts and get enough for 3-4 people. if you wanted the sauce thicker, I would add a tablespoon of cornstarch mixed into 2 tablespoons of water, but I actually like it thin like this. With noodles it would make awesome soup (which is, of course, kind of what it was supposed to be anyway). Thinly slice your onion and julienne the carrots. Put aside. In a large skillet, pour your oil and heat to medium high heat. Sautee onions until translucent and slightly golden and then add carrots. Pour in 1 c of stock or dashi and cover. Let cook 3-5 minutes until carrots soften. Pour soy sauce, mirin, and stock into a large bowl and mix. Put aside. Remove vegetables and put side. Put beef into pan and cook until mostly browned. Add vegetables back, then pour in the sauce mixture. Bring to a simmer and simmer for 5 minutes, or until meat is cooked through. Those bowls are too cute!! Love recipes from Epcot. Going to try this in the future! Cute bowls! Thank you! I hope you try it, and do let me know what you think!! !